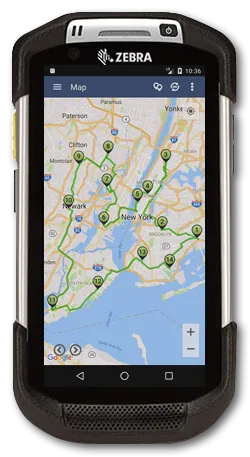 Run the world's most used route optimization software on the world's most rugged smartphones. It only takes 10 weeks after purchase for the average iPhone user to damage or destroy their smartphone. Mobile devices are even more likely to be damaged when they’re used in construction, mining, utility service, or any other industry that requires workers to go out and get their hands dirty. iPhones and most Android smartphones just weren’t designed to deal with the unforgiving conditions of hostile operational environments because they are mostly consumer-grade devices. Extreme heat, extreme cold, wet weather, vibration, tumbles, and drops will quickly wear them down. Even retail warehouses can be harsh environments for mobile devices, as they’re full of dust that will harm electronic equipment over time. Warehouse workers or those higher up on a truck or loading dock are prone to dropping their smartphones on concrete floors as well. Zebra mobile computers were designed to survive with these extreme conditions in mind. They’ve been drop and tumble tested to ensure that they can survive all kinds of abuse. They’re immune to water and dust damage, and they can handle triple-digit temperatures, sub-zero temperatures, and dramatic temperature swings. 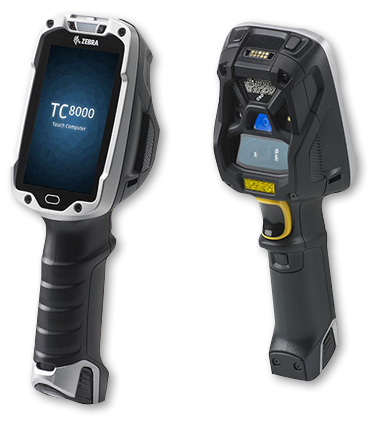 Zebra’s device torture tests are so thorough that most “over-the-counter” rugged cellphone cases simply don’t stand a chance. Non-rugged devices have an annual failure rate of 10 - 23%, while Zebra devices have an annual failure rate of just 4 - 7%. Each failure will cost you 80 minutes of productivity and 100 minutes of support time. Zebra devices save you money by saving you from the hassle of constantly repairing and replacing your mobile devices. In addition to being durable, Zebra devices have exceptionally long-lasting batteries. They won’t die on your employees in the field, so you can always keep track of your team. Zebra also provides better mounting solutions than most other mobile devices. That makes them especially easy and safe to use while driving, which helps your employees focus on the road and avoid collisions. Route4Me’s main goal is arguably to improve business speed and operational efficiency. That’s why a “near bulletproof” smartphone isn’t the only benefit of Zebra devices - there’s a lot of power under the hood, too. These are high-performance machines capable of running the most advanced enterprise software reliably. Zebra devices can connect with many other products and can be expanded with the Zebra app marketplace. Integrating them into your existing system is simple and pain-free. These devices will streamline your workflows and increase efficiency. In the warehouse, they will help you stage orders, verify shipments, replenish stock, and update inventory more rapidly. Overall, you’ll be able to get more work done with fewer workers. 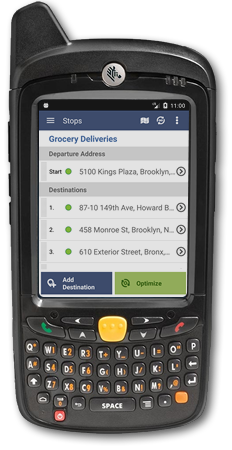 In the field, you can use Zebra devices to capture and send information, such as electronic signatures and photo records of delivery. When paired with GPS tracking software, these mobile computers become homing beacons that show you the location of your drivers in real-time. Plus, you can pair it with a mobile printer, to print new labels on-the-fly. You already know that Route4Me is must-have software for any business that relies on field employees. With Route4Me, most routes are optimized and dispatched in seconds. And, if there’s ever a reason to make a last-minute adjustment to your route, such as a highway closure or an order cancellation, you can re-optimize the route and share the changes with your driver instantly. Any change you make to a route is automatically shared with the user assigned to that route. You’re all accessing the same information at the same time. 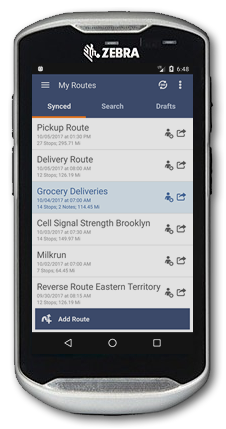 Also, Route4Me can be used in the warehouse, distribution center, or facility to create faster and more accurate picking routes. This one-two punch lets you boost productivity before your people ever go on the road. 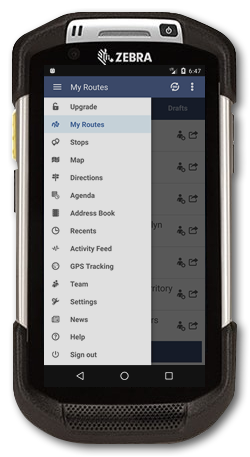 On top of route optimization, the Route4Me mobile app offers GPS tracking, geofencing, real-time chat, and much more. It gives you everything you need to manage your entire business from your Zebra device. In addition to hardware testing, each Zebra device’s operating system version is also rigorously tested for compliance and huge efforts are made to make each device tamper proof. These customizations prohibit mobile users from watching costly streaming video, installing applications, and prevents them from using the device for non-business purposes. You can remotely control each Zebra device and have ultimate peace of mind that all your people are trained on the same hardware and software, so that you have an entirely consistent platform within your organization.